Everywhere nowadays, you can't seem to be able to get your job done without the help of your trusty PC. It is more than just a tool, it makes your job, your life easier. 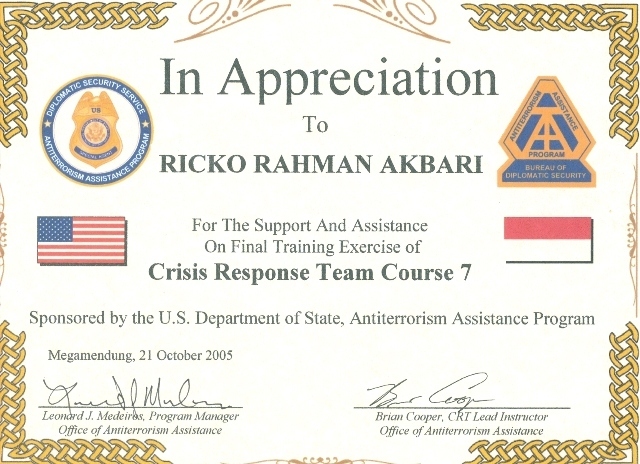 DS ATA is currently providing the Indonesian National Police with various trainings. One of them being Tactical Entry Training, due to the nature of the course, I began to get my hands on some of the weapons they are using, such as Glock 17, M4, and Armalite AR-10 Sniper Rifle. Even though I do not proclaimed myself as an excellent marksman or gunman, I can say that I am able to distinguished the part, take them apart, re-assemble them and fire them. I am currently re-learning my Japanese language skill. I believe in challenging myself. I also found Japan to be a remarkable nation. I have used English language ever since I attended school in Jane Mears Junior High School back in Alaska, USA. Due to the nature that my current employment is under the US Embassy and I have been working there for nearly 5 years now. English is basically my second language. To work as a Public Relation Officer. 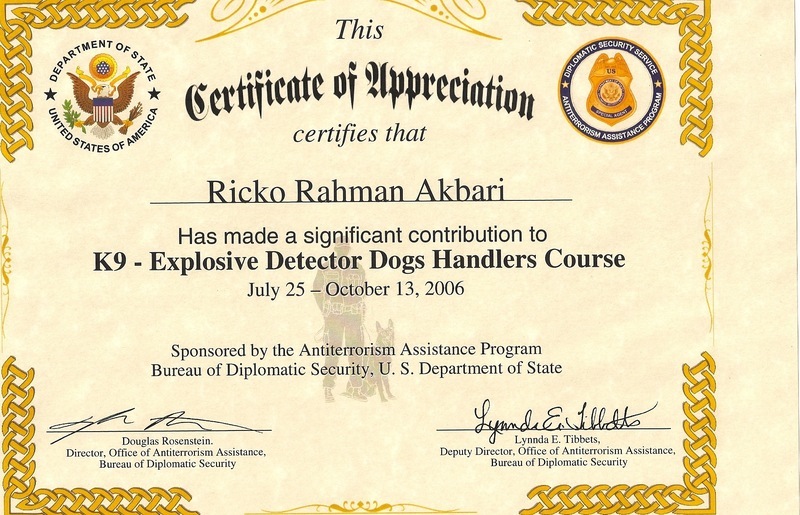 My name is Ricko Rachman Akbari, male and 30 years of age. I have finished my degree from the Accounting Department, Faculty of Economics, Trisakti University, Jakarta, with a GPA of 2.9. I am a mature, assertive, and result oriented team player. I am able to interact with people from various social strata, as I have successfully demonstrated in many activities of Senate of Economic Faculty in Trisakti University and lately my office’s activities. 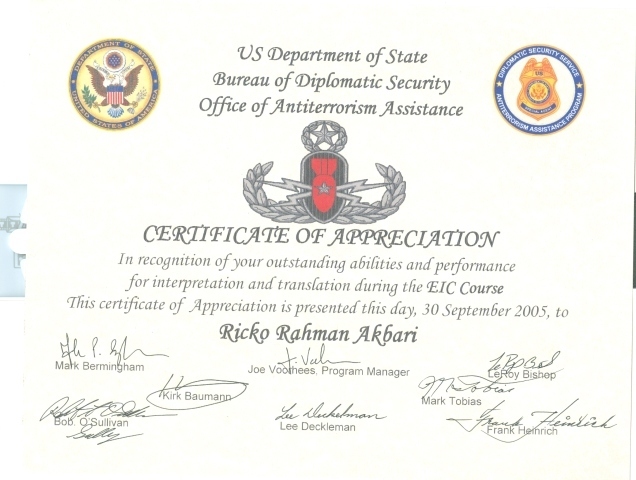 I have been working for DS ATA (Diplomatic Security Anti Terrorist Assistance, a join effort between US Embassy and Indonesian National Police) since May 2004; I found a tremendous foundation of my career and opportunity to gain more knowledge through some leadership trainings. I have attended various colorful experiences which have heightened my perspective. During my four years of professional experience I have proven my worth and constantly received praise from our latest Supervisor and also in implementing my company needs before mine. 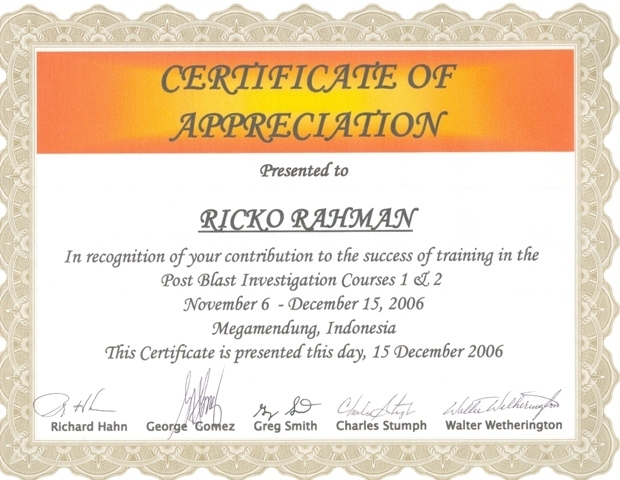 My job description which I have managed to achieve varies from giving training in different fields for numerous Police Officers and Officials, supporting the curriculum division and conducting advance training for Business Executives. Moreover I have also managed to maintain good rapport with my employer and many well-known officials in the National Police. I believe that my education and professional experiences would be of great value to your company. In the other hand I am also sure that working with you would be a great challenge and opportunity for my future career.